Plate five from the first volume of James Forbes'"Oriental Memoirs", a work in the form of a series of letters richly illustrated, describing various aspects of nature, people and buildings he observed during his travels in India in the 1760s-70s. Forbes(1749-1819) spent most of his working-life in India in Gujarat where he held the post of Collector in Bharuch and Dhaboi. 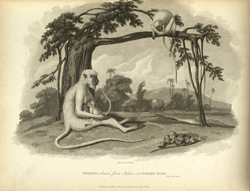 The monkeys illustrated in the plate were found in large numbers by Forbes near 'Cubbeer Burr, the giant Banyan tree growing on an island' in the river Narmada in Gujarat.